Apex live storage racking provides the densest form of storage for the warehouse. Aisles are dedicated to either input or output and can be accessed using standard types of trucks. Apex live storage racking provides the densest form of storage for the warehouse. Using dedicated lanes for input and output means that pallet loads can be loaded and unloaded fast. 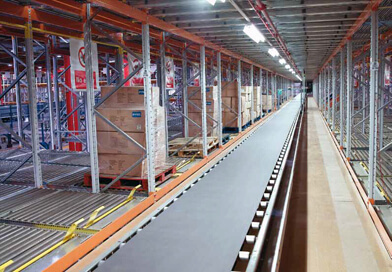 Gravity rollers are fitted to the bed of each rack so that pallets roll through from the input aisle to the output aisle by gravity. This process eliminates the need for operatives and forklift trucks in shifting the pallets. Apex Pallet Live Storage is a flexible pallet racking system and is suitable for a wide range of loads. All of our Apex Live Racking can be manufactured to meet the bespoke requirements of the client, meaning that whatever your warehouse operation needs, BSE can supply, fit and install. The First-in Last-out (FILO) principle is the ultimate storage model for efficient stock rotation. With unrivalled speed of throughput thanks to the nature of this automatic stock rotation system, Pallet Live storage is one of the most efficient storage systems on the market. BSE UK can design, supply and install a Apex pallet racking system for your warehouse. Call us now on 01179 555 211 for a free quotation and maximise your storage space today.